Film POSITIVE cut to the size of your press sheet and having on it all the images that are to be die cut. Please indicate which lines cut, perforate, or score also mark the gripper and side guide. Sheetwise printing of images is best (scoring should be done from outside of piece). Maximum sheet size: 29-1/2" x 41"
Minimum sheet size: 13-3/4" x 17-5/8"
Maximum die area: 28" x 40"
We use one piece boards for our dies. Printed press sheet: Center on 40-1/2" with your gripper edge matching the lead edge of board. USING DIES WITH DIFFERENT SPECS MUST BE DISCUSSED PRIOR TO QUOTING. We are more then happy to discuss our dies needs with your die maker. You can use almost any weight paper you want. 60# book or lighter or 40pt and above should be discussed before quoting. We have a two station die cutter which allows for Stripping (removal of scrap area) or Blanking (removal of piece from sheet). Either of these require additional set up and are generally used on longer run repeat work. 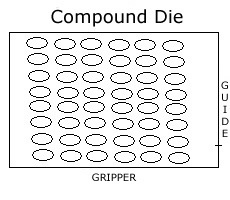 Die costs are based on inches of rule and complexity of layout. 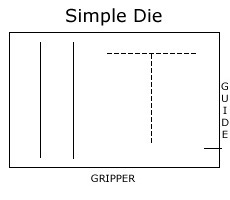 See diagrams below for basic die types. Please provide a diagram if an exact die cost is necessary. Please provide the following information. Sheet size, Weight of paper, What the next operation is, Quantity of sheets. Straight scores or perforations limited right angles. Combination of cutting rule and scores, usually straight or limited use of angles. Note: we stock many pocket folder dies, please check with us for type and layout. Use of irregular shapes or heavy use of straight perforation, cutting, and score rule. 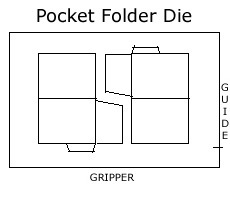 Note: simple curved rule limited in number (1-3) with minimum perforation, cutting, and score rules would fall into Pocket Folder Die cost category. 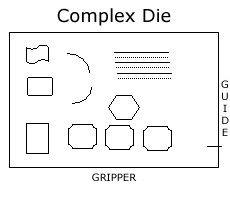 Like Complex Die but requiring a second set of stripping or blanking dies for second station of die cutter to facilitate production of piece.